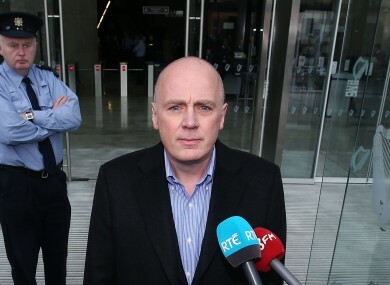 Drumm faces two trials here in Ireland. FORMER ANGLO IRISH Bank chief executive David Drumm has cut the price of his American home by another $25,000 (€22,000). The home, in Wellesley, Massachusetts is now worth $1.85 million (€1.6 million). That is $75,000 (€66,000) less than it was worth when it hit the market just two months ago. The home Drumm shared with his wife Lorraine was put on the market just after he returned to Ireland. He faces two trials, having been charged with 33 counts under separate bills concerning alleged offences committed at the now defunct bank. He has yet to enter a plea to the charges. He faces two charges of conspiring to defraud depositors and investors at Anglo by “dishonestly” creating the impression that deposits in 2008 were €7.2 billion larger than they were. He faces one additional charge in relation to the EU transparency directive. He will stand trial for these offences on 24 April 2017. The case is expected to take 12 weeks. The 1938-built home is described by selling agents Coldwell Banker Homes as “beautifully renovated with European flair”. The four-bedroom, four-bathroom house is subject to almost $20,000 (€18,500) in property taxes a year and prospective buyers face an estimated mortgage of around $8,400 (€7,800) a month. The master bedroom features a full bathroom with double sink, hot tub and custom-built wardrobes. The house has extensive work, references to which were used in his extradition hearings in the US. One of the letters – from a person who worked as project manager on a four month-long construction job at the Drumm family’s home in Wellesley – notes that “on many nights when we worked late David and his wife would invite me and the other workers to enjoy a family meal with them”. Comments are closed as there are ongoing court cases. Email “David Drumm cuts the price of his American home by $25,000”. Feedback on “David Drumm cuts the price of his American home by $25,000”.